Rules and guidelines for the King’s and Queen’s Bardic Champions Competition are now available. They are printed below and can also be found at this webpage. In an effort to encourage the bardic arts, we suggest that attendees bring small tokens to be given to any performer you find particularly pleasing. You must pre register for the Competition. All entrants must submit an email to the King’s Bard no later than 1 week before the competition indicating their willingness to compete. Out of courtesy to the autocrat & event staff please ALSO pre register for the event. On the day of the competition each performer shall submit a brief “resume” (such as would fit on an index card) listing the performance types and styles (e.g. songs, stories, jests, musical instruments, poetry, improvisation of diverse kinds, etc.) that the performer is willing to offer upon request, should the performer reach the finals. Competitors are encouraged to be specific (see below for examples). Their Majesties will pick for each finalist one of the performance types listed on that performer’s resume for the final round. This gives the performers a chance to display versatility as well as skill, and gives Their Majesties additional information as they “audition” their next bardic champions. Competition Format: The competition will take place over three rounds. All performance pieces should be period, period-style*, or otherwise SCA-appropriate**. All performers must perform at least one period or “period style” piece with documentation in either the first or second round. Excessively bawdy or overtly adult themed offerings are not welcome. Round 1: Pieces may not exceed 4 minutes, and can be period, period-style, or SCA-appropriate. Round 2: Pieces may not exceed 6 minutes. Competitors in this round must perform a period piece if they chose to do a non-period piece in Round 1. Round 3: The assignment for the final round will be determined by Their Majesties, guided by the performer’s earlier works, as well as the information obtained from the performer via their resume. Performers will have a few moments to prepare between the assignment from TRM and the start of performances. *A period performance is defined as a song, story, or other performance that can be plausibly documented prior to 1601. Original compositions based on period rules of composition, original stories based on period styles, contrafacta to a period tune, and other such performances can be considered a period-style performance, with the required documentation***. For example, a performer could sing a period song with lyrics that have been rewritten modernly, tell a story from the Decameron in English, play an original tune in a period style on recorder, or recite a modern English translation of an Old English poem. Note that original works need not be written by the performer, so long as the style is documentable prior to 1601. **An SCA-appropriate performance is any non-period piece of an appropriate nature for an SCA Bardic event, which cannot be documented prior to 1601. This would include things like SCA folk songs, or traditional pieces or stories that do not break the illusion of the medieval & Renaissance periods. *** Documentation is required for at least one of your performances in the first two rounds, and can be supplied on an index card. For all questions concerning documentation, or assistance, please contact one of the current Champions. 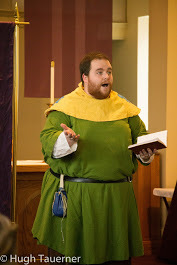 Romanus Gaius Cantus (SC, OTC, Troubadour) – Roman-style boasts, filk on any topic to the tune of the Maltese Bransle or Greensleeves, good at extemporaneous speaking, can chant war-style marching songs in Latin. Excellent at theatre-style reading text I have not seen before. Skihald the Viking (King’s Bard to John VIII, Troubadour, Order of the Maunche, Order of the Laurel) – Perform and write Norse-styled poetry in English, tell skaldic tales from 4 to 10 minutes in length from hilarious to morose, excellent teller of jokes, intermediate juggler, have several magic tricks I have worked into period settings. Ysibeau du Provance – Period pieces in French for solo voice or recorder, Latin sacred music of the 12th century, improvisational harp. Can write small praise poems in French and English with some notice. Familiar with some music from most SCA periods, and SCA-appropriate songs. I am good at selecting music for different occasions. Haven Fortnight (Bard to Baron of the Place) – I know a handful of period pieces, but my strengths are really SCA-appropriate non-period songs composed by others (traditional, folk tradition, SCA-composers) or by myself. I also play guitar. I can write pieces on commission with some notice. I can play and stroll at the same time. I can write in rhyming verse on short notice on nearly any topic and present it. On a day befitting the name of our hosts, Concordia of the Snows, thirteen exceptional performers assembled to vie for the positions of King’s and Queen’s Bards. The competition consisted of three rounds, with each performer given a total of 15 minutes to use over all three rounds (with extra time available for the finals at their Majesties’ discretion). In addition to Their Majesties Brion and Anna, the judges for the competition were Mistress Alys Mackyntoich (Queen’s Bard), Lady AEthelflied Brewbane (King’s Bard), Master Grim the Skald and Master Michael of York. The first round performances ranged from period documented pieces to SCA folk songs, poetry and prose, and even instrumental music combined with vocal song. The competitors did not make the task of deciding who should advance to the second round easy on the judges. After much debate, eight performers were asked to return to offer a second piece. They were: Countess Megha, Lady Lillie, Lady Lorita, Maestro Orlando, Lord Robert, Maitresse Sabine, Lady Solveig and Mistress Ysemay. Once again, the performances were stellar, and selecting four to advance to the finals was not easy. Ultimately, Countess Megha, Maestro Orlando, Maitresse Sabine and Lady Lillie were asked to offer a third performance. Countess Megha performing her first round piece. As is traditional, each finalist was given a challenge based on the performance resumes they had turned in at the beginning of the contest. Countess Megha was asked to prepare an inspirational speech on the subject of Winter. Maestro Orlando was asked to offer an Elizabethan monologue on the subject of Autumn. Maitresse Sabine was asked for a contrefacte (new lyrics added to existing music) on the Spring. Lady Lillie was asked for a song on Summer. They were given 30 minutes to prepare. Maitress Sabine in the first round. All four finalists rose to the challenges before them with passion, vigor and excellence. Maestro Orlando presented an original Shakespearean sonnet that he had written in 30 minutes. Countess Megha used her 30 minutes to adapt an existing period Indian poem about the rainy season and the generosity of Kings. Maitresse Sabine wrote and sang new words to go to the period tune E, Dame Jolie by Guillaume de Machaut. Lady Lillie presented an original song she had composed about the battle with the heat at this past Pennsic War. At the end of the day, Queen Anna chose Maitresse Sabine as Queen’s Bard and King Brion chose Countess Megha as the King’s Bard, with much acclaim all around. Maestro Orlando was inducted into the Order of the Troubadour based in large part on his performances during the competition. Mistress Alys and Lady AEthelflied thank all the competitors for their hard work, passion and willingness to perform, as well as the people of Concordia of the Snows for putting on a splendid event. Article written by Mistress Alys, photos by Cateline La Broderesse. It’s February 1st. 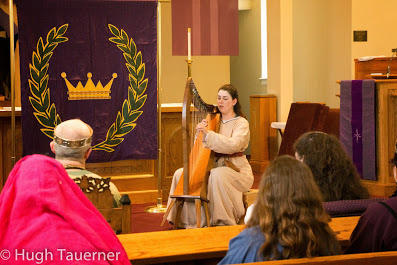 You have only six days (until February 6th) to preregister with Mistress Alys Mackyntoich if you want to compete in the King’s and Queen’s Bardic Competition. Because A&S and Bardic are being combined into the same event this year, it is essential that you pre-register to compete. If you show up on the day of the event, without having contacted me in advance, you will not be able to compete. You pre-register by e-mailing me your name and a statement that you wish to complete, to alys.mackyntoich@gmail.com. The King’s and Queen’s Bardic Champions were announced today at the event held in the Shire of Owlsherst. The finalists were Lady Aethelfeid Flied Brewbane, Mistress Alys Mackyntoich, Lord Drake Oranwood, and Mistress Sol la Cantor. Queen’s Champion is Mistress Alys Mackyntoich. King’s Champion is Lady Aethelfleid Brewbane. Laughter from the audience and applause filled the Bardic champions event throughout the competition, but particularly during the finals. The crowded field was narrowed down to six performers, who were given challenges to perform in the final round by the Royalty. The final six are listed below with links to videos of their final round performances courtesy of Mistress Sol la Cantor. Many of the performances before the finals were wildly popular with the audience and can be viewed on YouTube also courtesy of Mistress Sol. What constitutes an “SCA Theme”? of works might be categorized as “SCA Themed”. which you or another SCAdian have written about us. please do not hesitate to email me. The Barony of Bergental is pleased to be hosting this year’s King & Queen’s Bardic Championships in conjunction with our traditional Novice Schola and Baronial Birthday on March 8th. The competition will take place over three rounds with the following parameters: first round, a piece written on an SCA theme OR a documentably period piece; second round, the other of the two options given in the first round; third round, Their Majesties’ choice. technical skill, and individual response. 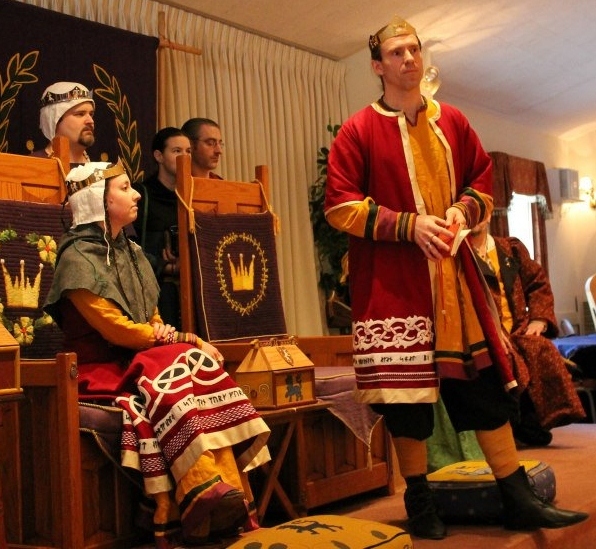 Royal Bardic Champions will take place at Novice Schola in the Barony of Bergental on March 8. This event is traditionally for newcomers to learn about life in the Society, and thus there is no site fee required. Donations to defray the site cost are gratefully accepted. The event will take place at the Bethesda Lutheran Church in Springfield, MA. Their Excellencies Bergental will be cooking a dayboard, which will be a separate fee still to be determined. Instead of a feast, they will be taking names for reservations at the Munich Haus Restaurant in Chicopee. For further information, contact Sir Cedric of Armorica. Item. Their Majesties accepted the fealty of Fergus and Imigla, Baron and Baroness of Carolingia. Item. Their Majesties caused those good gentles new to our Society to be brought before the Tyger Thrones, and did gift each with tokens of the day.